My son has been using Nivea shampoo for quite some time and I want to try something new. 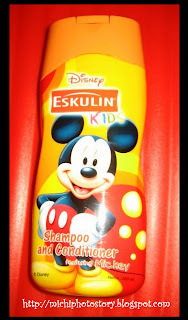 While checking the grocery shelves, I’ve found Disney Eskulin Kids. I was attracted with the packaging so I bought this one. It is shampoo and conditioner in one with aloe vera extract. I like the smell and the scent lasts longer than Nivea shampoo. P103.75 for 200ml. My kids are still using the J&J Top to Toe wash. Feedback sis so I can switch if the product is good. ^ congrats on your baby girl. she's too young for this shampoo. =)my son use lactacyd too, for about one month then i shift to cetaphil, mas ok siya.